alaTest has collected and analyzed 30 reviews of Sony 3D Blu-ray Disc Player With Full HD 1080p Resolution, Built-in 2.4 GHz Sony Super Wi-Fi, 2D/3D Full HD 1080p Playback, Dolby TrueHD & DTS-HD Mast. The average rating for this product is 4.0/5, compared to an average rating of 4.6/5 for other products in the same category for all reviews. We analyzed user and expert ratings, product age and more factors. 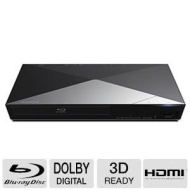 Compared to other products in the same category the Sony 3D Blu-ray Disc Player With Full HD 1080p Resolution, Built-in 2.4 GHz Sony Super Wi-Fi, 2D/3D Full HD 1080p Playback, Dolby TrueHD & DTS-HD Mast is awarded an overall alaScore™ of 84/100 = Very good quality.